Home / Columnists/ Selecting a competent construction worker: A conjecture? Selecting a competent construction worker: A conjecture? Once, I wanted the service of a plumber to install a new, natural gas line for an outdoor built-in barbeque structure. This was as an extension to the existing gas supply line. It is noted here that, in Australia, where I live, natural gas supply lines are available at the road side and the installation of gas lines is a plumbing activity. It was an expensive job, not due to the complexity of the job but due to the need of a licenced installer to carry out the work. At the completion of the installation, I was issued with a compliance certificate, attesting that the work had been carried out according to the Australian Standards and the Building Code of Australia. A copy of the compliance certificate had been uploaded to the website of the utility authority by the plumber, as a compulsory official record of the work. By the way, while progressing with the installation, I asked the plumber whether he could also install a water connection point near a water-closet so that I could later connect a douche (flexible hose spray unit). He initially refused to do it saying that it would be an illegal work. Then, he explained me that if I really wanted it at that location, it must be accompanied with a back-flow prevention device at the connection to the supply line. This device was needed to prevent contamination of drinking water supply due to back flow effect of unhygienic water in the toilet. I had to abandon the idea due to the high cost involved and the compliance issues. The message I received was twofold. In Australia, only licenced tradesmen are allowed to carry out significant construction works and they should abide by the legislative requirements and national quality standards. 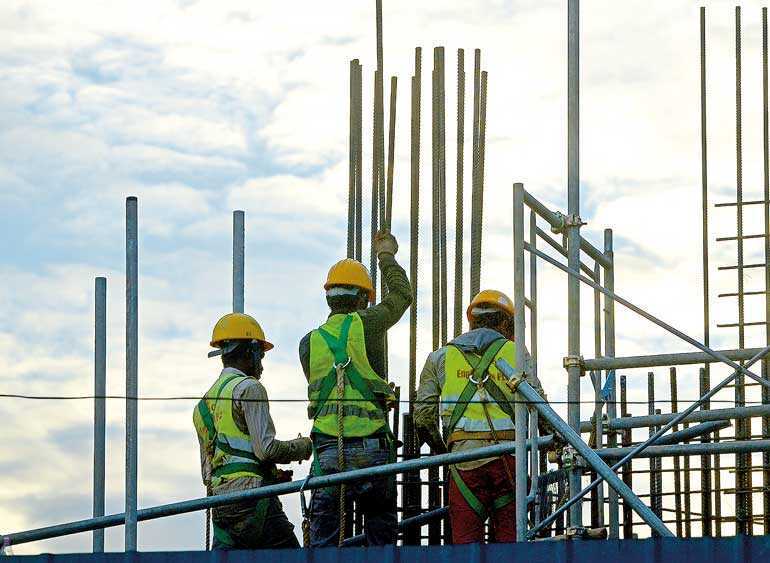 If any illegal construction works are done, there will be legal consequences to the executor (the worker) as well as the receptor of the illegal work. During my recent visit to Sri Lanka, an ardent reader of Daily FT (a close relative of mine as well) opened up a discussion on the inability to recognise good workmen as there is no systematic and reliable method to do so. In Sri Lanka, one has to rely upon personal recommendations and references to select a tradesman such as a mason, a carpenter, an electrician or a painter. The inherent issue here is that there is no established quality benchmark that comes with the personal recommendation. The recommender’s assertions such as “good, bad, alright” are relative assessments and these recommendations are only valid under a particular set of operating conditions in a given work environment. “Good” under certain operating conditions is not necessarily “good enough” under a different operating environment. Hence, until the worker finishes the construction work, no one could envisage what would be the quality of the outcome. This is not a healthy situation for a developing country. The construction industry needs a comprehensively assessed qualified, skilled and competent workforce. Hence, what a country needs is an established worker skill and competency assessment process and a regulatory system of issuing relevant work category licences. This would guarantee that the licenced workers possess the minimum required levels of knowledge, skills and experience to perform specified tasks, in a safe manner. It took a while for me to understand how the Australian education system operates and how migrants’ overseas qualifications and training components are assessed and recognised for accreditation purposes. This understanding was enhanced through my personal involvement of getting my own professional qualification assessed and also selecting different study courses, during the last 20 years. I must confess that this information may not be complete enough to cover the whole system set-up but as a catalyst, this would be good enough for Sri Lankan authorities to initiate a professional discussion on this subject. The Australian Qualifications Framework (AQF) is the national policy for regulated qualifications in Australian education and training. Anyone could follow a formal educational study program and or a training program provided by an educational institute but what matters at the end of the day, is whether the particular study or training program could be slotted into the Australian Qualifications Framework and whether the program is formally recognised under the AQF. In the AQF, there are 10 progressive levels that are described in terms of knowledge and skills. A person who achieves the Level One has the foundational knowledge and foundational cognitive, technical and communication skills. That individual has the ability to apply this knowledge and skills in highly structured and stable work environments. On the contrary, the Level 10 would give a person systematic and complex body of knowledge and expert cognitive, technical and research skills. Such a person can apply his or her knowledge and skills with autonomy and makes expert judgements as a leading practitioner of the chosen profession. Then, there is a hierarchical qualification list under the AQF and the aforementioned levels are incorporated into the types of qualifications. It starts with the Certificate I, II, III, IV and progresses with Diploma, Advanced Diploma, Associate Degree, Bachelor Degree, Bachelor Honours Degree, Graduate Certificate, Graduate Diploma, Masters Degree and Doctoral Degree. My focus here is the certificate level qualifications. Certificate level qualifications are highly relevant to the workers who follow instructions and carry out operational level works. A developing country must pay attention to this area as the quality of the construction outputs depends on how organised the system administration processes at this level. It must be emphasised that in Australia, just having the educational certificates would not be enough to become a licensed tradesperson such as a plumber, carpenter or an electrician. The formal qualifications at this lower spectrum of the framework only covers the educational requirements for a potential licensee. After obtaining formal educational and training qualifications, to qualify for a licence, one must work for a nominated period as an apprentice, under a licenced tradesman of the relevant trade category. Upon evaluation of both qualifications and apprentice’s training components, the relevant licensing authority would issue an annually renewable trade licence which would ‘only’ allow the person to work as a contractor (tradesperson) under the supervision of a licenced supervisor. After gaining the nominated period of work experience as a contract tradesperson, the particular individual can apply for a supervisor’s licence which would allow him or her to work as an independent tradesperson without someone hovering behind as a supervisor. The licence holders have strict work conditions imposed by the licencing authority, warning them not to carry out non-compliance, unsafe and un-licenced works. Any proven complaints and legal actions taken against a licenced tradesperson are recorded under the name of licence holder and these records are open for public scrutiny. Anyone could check on the trade licence number and find out whether the licence is currently valid and or whether there are any previous non-compliances or complaints recorded against the licenced person. Australian society is multi-ethnic and multicultural. People migrate to Australia from many countries. Obviously, many of these immigrants have a wide variety of formal qualifications, training, experience and skills. However, these credentials are not exactly equivalent to the same, within the Australian system. ‘Giving a fair go’, ‘recognition of practical ability to perform tasks over the paper qualifications’ and ‘safety first’ are the three main concepts in focus during the assessment process. No overseas qualifications are directly accepted for issuing a trade licence in NSW, Australia. The applicants who obtained overseas training have the responsibility to demonstrate their skills and knowledge through a structured assessment process to obtain licences. Australian Skills Quality Authority registers training providers and they are called Registered Training Providers (RTO). There are around 5,000 regulatory authority registered training organisations in Australia who are providers of quality assured, nationally recognised training and qualification. Also, the Trades Recognition Australia (TRA) is a skills assessment service provider specialising in assessments for people with trade skills gained overseas or in Australia. TRA also registers and approves training providers. Where is Sri Lanka heading? This is the question the general public asks from the Government regulatory authorities that are responsible for formulating and administration of construction sector regulations. The quality of life of a nation heavily depends on fulfilment of their basic needs. The availability of reliable, compliant, quality basic utility services at affordable prices is an essential ingredient of this quest. In the developed countries, the public authorities work hard to ensure properly commissioned utility services are available at the front of each property so that the residents can engage a utility service provider to make the necessary connections. Residents of newly developed suburbs in Australia have underground-laid services such as water, gas, electricity, high speed broadband internet, telephone, pay TV located in the road reserve in front of each property. This should be Sri Lanka’s long term aim. In Australia, it is the responsibility of the residential and commercial property owners to install own utility service lines within their land and extend such service lines up to the boundary of the road reserve so that the utility authorities could approve the service connections, when requested. Utility authorities would not approve the connections, if the builders have not completed the construction works according to the Australian Standards. This means that only the licenced builders, plumbers, carpenters, electricians are allowed to install such service lines and carry out construction and building works. To streamline this process, there should be a well-qualified workforce and also a comprehensive regulatory system to train people, issue licences and re-train them periodically, in line with the changes to the quality standards and the legislative provisions. In Australia, such a system is in place. Sri Lanka needs one. Sri Lankan general public wants the value for money spent on construction works. They expect quality and compliant work. Sri Lankan authorities have a duty to ensure the public receives this. I understand that there are so many capable Sri Lankan tradesmen who don’t have paper qualifications. That is perfectly fine as the ability to do the job matters the most. However, what is required is an assessment process of their practical capabilities, skills and knowledge and place them on a “Quality Scale”. They must be educated on what tasks are allowed for them to perform, how works are done safely maintaining acceptable minimum quality. Especially, the trained workers should know their knowledge and proficiency limitations and when and for which, they should seek assistance from a supervisor or an expert. In Sri Lanka, especially in out-stations, untrained, unqualified workers rip-off the general public by undertaking works outside their capability domain. Often, some engineering assistants pretend as assistant engineers, draft-persons act as architects, masons act as construction officers and electricians act as electrical designers without undergoing any accreditation process before attempting relevant works. A cook is not a chef. While a cook can follow a recipe and make a meal, a chef could use a variety of ingredients, develop an innovative recipe and make a delicious meal. In the Sri Lankan construction sector, many cooks act as chefs producing inedible meals. The whole country is getting sick. This is an alarming situation. I am not against the people with practical experience over formal qualifications. My request is to implement an assessment and accreditation process and issue them relevant licences. Hence, there should be a licencing system in place for Sri Lankan skilled workers for each trade-work category. This must be implemented within a sound legal framework to crack down unlicensed works and to take legal actions against violators. The ball is travelling fast towards the regulatory authorities’ bat. Play it or let it pass to the keeper is their choice. The country’s future prosperity depends on their choice.